user-generated Headlines and reports on this page = 4 news items. Page - 12. STAGECOACH Merseyside, Cheshire, and South Lancashire have upgraded its fleet, investing over £4 million in the region, including 1st of its kind next generation buses across Merseyside. The company, which operates over 400 buses across the 3 regions, will boost its fleet by 18 vehicles, 11 of which will operate on the X2 route from Liverpool to Preston via Southport, with the additional seven operating out of the Birkenhead depot. In a 1st for the business, the new X2 vehicles will include a number of table seats complete with USB ports, allowing passengers to stay connected while on the move. They will also feature deluxe e-leather seats and LED reading lights, among other features. The investment also sees seven new Gold buses arriving on the 471 and 472 routes from Heswall to Liverpool. These luxury buses feature:- hand stitched Italian designed leather seats; friendly, uniformed drivers; Euro 6 standard engines complete with stop/start technology to help cut exhaust gas emissions; free Wi-Fi; and new interior design which includes noise reducing moquette fabric. 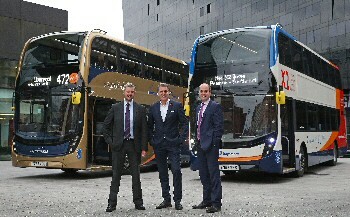 Rob Jones, managing director of Stagecoach Merseyside and South Lancashire, said:- "Stagecoach is committed to continually investing in our fleet in the Liverpool City Region; ensuring we deliver sustainable, comfortable, high specification vehicles to our customers; providing them with a 1st class experience. The new buses being introduced on the X2 route are a 1st for the business and we're delighted to be launching them. We have worked closely with the design and engineering teams to incorporate a range of new features, which will make the passenger experience even more pleasant and comfortable. We're expecting the table seats to be a real hit, both with commuters who want to work on the go and with families or friends who want to sit together socially as a group. The new features will also enable people to use their time on the bus more productively, with LED reading lights, tables and free on board WiFi making it easier than ever to stay connected or, particularly with the dark mornings and nights as we head into winter, just relax and read on their journey. I am delighted that we are also growing our Gold bus outreach in the region, adding to existing Gold buses that currently run between Liverpool and Chester." Stagecoach Bus is 1 of the UK's major employers, supporting around 24,000 jobs across the UK and 1,209 jobs in Merseyside and South Lancashire. Over 200 people have completed apprenticeships with Stagecoach since 2004 and the company currently employs around 150 apprentices. All Stagecoach vehicles are fitted with eco driving systems which lower emissions and the company has shown the biggest commitment to using 100% biofuel of any UK bus operator. Stagecoach is part of Liverpool City Region's Bus Alliance, a partnership between Liverpool's biggest bus operators and Merseytravel. The Alliance is focussed on quality of vehicles and customer service, value for money journeys and straightforward travel from simple fare structures to easy to understand journey planning and a clear, simple bus network. Follow the company's website or follow them on Twitter for more information and company updates. THE talent, creativity and diversity of young people across Merseyside will be celebrated when the Now Festival returns to the Epstein Theatre. With at least 1 in every 10 young people suffering with poor mental health, and the huge pressures facing education at the moment, this festival gives young people the opportunity to have their voices heard on these important issues. The 2018 festival takes place at the Theatre, from Tuesday, 30 January 2017 to Friday, 2 February 2017, where local children and young people will showcase live performances and films devised around the theme of My Education, My Mental Health. 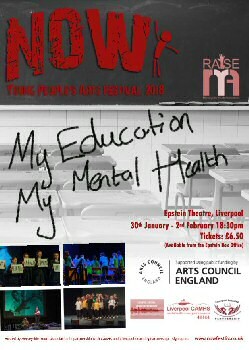 Now was founded in 2015 by festival director Kath Thompson as part of her work with the RAISE mental health team at Merseyside Youth Association. She was inspired by her previous work teaching performing arts in South Africa, where she saw the empowering effect festivals had on the young people who got involved. The festival aims to engage young people in creative discussions around the topic of mental health. Previous festival themes have been Mental Health and Technology, and Mental Health and Children's Rights, with those taking part devising a piece of dance, drama or film. In 2018, the opening night will be a 'Now Festival Sefton' featuring performances from young people across the borough, while there is also representation from Wirral in the 2018 event. And MD Productions' Girl Talk will write a new song around the topic which will be combined with a drama. Kath Thompson says:- "The festival is going from strength to strength. We want to see it continue to be an annual event in Liverpool and see the model rolled out in all cities, getting young people using the creative arts to talk about mental health. 1 of the most exciting elements is taking them on the road after the festival. It's really powerful when you get young people talking to other young people and sharing their experiences." Theatre Manager Rebekah Pichilingi said:- "We are delighted the Now Festival is back for another year! The work accomplished through the festival is remarkable, which explores a wide range of crucial issues that young people face today. We cannot wait to welcome the festival back to The Epstein Theatre and urge you to show your support and book your tickets." 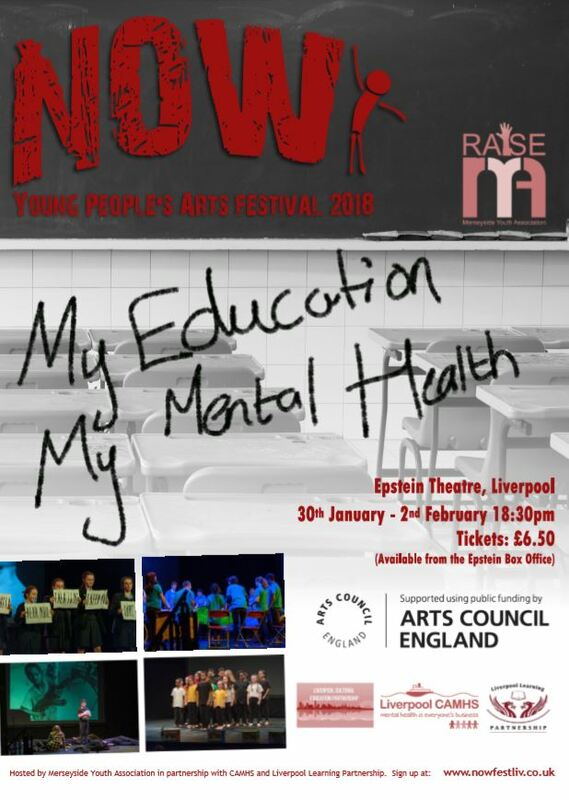 The Now Young People's Arts Festival is hosted by Merseyside Youth Association in partnership with Liverpool CAMHS, Liverpool Cultural Education Partnership, and the Arts Council. For more information visit:- NowFestLiv.Co.UK. LIVERPOOL City Council has submitted a planning application for a new £50m Cruise Terminal Facility on the River Mersey. Liverpool City Council is looking to create an "international standard," permanent facility which would enable the City to welcome the world's biggest cruise ships. The application includes the controlled removal of Princes Jetty and the construction of a new terminal set within a statement building, based on a new suspended deck structure in the river. In 2017 Liverpool welcomed more than 60 vessels, with 120,000 passengers and crew, but the Council wants to capitalise on the cruise boom by creating a state of the art passenger and baggage facility, complete with:- Passport Control, lounge, caf�, toilets, taxi rank and vehicle pick up point, to cater for Liverpool's growing appeal in the cruise industry. The current terminal generates more than £7m a year to the City's economy. The application is expected to be heard by the Council's Planning Committee in January 2018. If approved, site preparation at Princes Dock, in Liverpool Waters, is expected to start in Spring 2018. The Council is currently inviting tenders to select a Design and Build Contractor to construct the facility with a closing date for submissions will be on Thursday, 14 December 2017. This is a 2 stage contract award basis, with the 1st stage to develop the design and confirm the construction costs with appointed consultancy firm Ramboll UK. The 1st stage contract is expected to be awarded in March 2018. Tenders are also being assessed for the site investigation works needed at the Princes Jetty site, which has been gifted to the Council by Peel, and it is expected these works will also start in January 2018. The Council is also in the process of promoting a Harbour Revision Order through the Harbour Authority to construct the new terminal in the River Mersey. Further planning applications could potentially include supplemental projects with a new 200 room hotel and 1,700+ multi storey car park, to enhance the City's capabilities in handling the next generation of turnaround cruises, which can carry up to 3,600 passengers. Mayor of Liverpool, Joe Anderson, said:- "A new cruise facility is 1 of the City's most important regeneration projects of this decade and is vital to growing Liverpool's tourism economy. We want to provide the next generation of super liners and their passengers a world class welcome with a 5 star experience. A new cruise facility will also be a huge boost to our plans to regenerate the North Liverpool docklands and create thousands of new jobs which is why we're putting together the best team of experts to ensure we build this facility to the very highest standards." Although the proposed multi storey car park has been earmarked for the new cruise facility, the Council is reviewing locations North of Leeds Street, so it could also support initiatives around the Ten Streets creativity district. The Council, which recently held a 2 day public consultation on the scheme, is also investing a further £32m in upgrading the A565 to support the new cruise facility and North docklands and is also gearing up to create a £20m link road to extend Leeds Street to the waterfront to support a new £30m Isle of Man Ferry terminal. 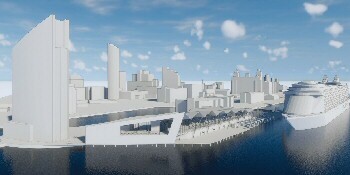 Relocating the cruise terminal will also enable the Council to remodel The Strand by removing junctions, such as the 1 servicing the current facility, that stem the flow of traffic along the key waterfront route. 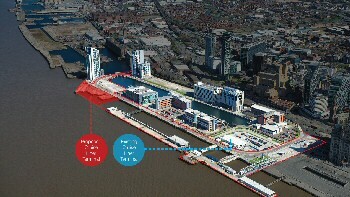 Liverpool City Council, which is currently overseeing £14bn worth of regeneration projects, is also carrying out further maritime and infrastructure investigations, environmental impact assessments and surveys and is working closely with Peel Land and Property as the gifted Princes Jetty sits within its £5.5bn Liverpool Waters scheme. Ian Pollitt, Assistant Project Director at Liverpool Waters, said:- "We are delighted at the progress the City Council is making with the new terminal proposals. We are working very closely with them and our other partners to progress the development and this planning applications is a major milestone in that process." SMALL businesses from across the North West are calling for effective integration of public bodies, greater infrastructure investment and the creation of a Council of the North in a new report urging accelerated delivery of the Northern Powerhouse. Authored by Federation of Small Businesses (FSB) representatives in Northern England:- 'An Entrepreneurial North' highlights the benefits of moving to a pan-regional small business support model as part of the Northern Powerhouse project. The 5 Local Enterprise Partnerships (LEPs) across the North West are receiving over �2 billion in the 6 years to 2021, with 45p in every �1 coming from European Union sources. The report suggests that Government plans to bring together different funding streams into a single UK Shared Prosperity Fund (UKSPF) marks an opportunity to more effectively integrate small business support services across the North. Also among asks are improvements to infrastructure in the North West and delivery of the Major Road Network. Projects flagged as of particular importance following a new survey of small businesses across the North West, are electrification of the Manchester - Bolton - Preston railline, widespread expansion of park and ride facilities and re-opening of the Colne to Skipton Railway. Phil McCabe, Development Manager, FSB Merseyside, West Cheshire and Wigan, said:- "3 years on from the 1st mention of the Northern Powerhouse and it's still hard to find concrete manifestations of it. With a week to go until the Budget, we'd like to see the Chancellor take some meaningful steps towards getting the show on the road. We need cast iron guarantees about EU funding post-Brexit. Firms across the North West are benefitting from EU support to the tune of millions every year. 1 thing's for sure, we won't have a Northern Powerhouse unless that money's replaced. Our LEP's and Growth Hubs are doing some fantastic work in supporting small firms across the region. Liverpool City Region Enterprise Hub, for example, is making significant inroads towards addressing the shortfall in start ups in this region. However, we do have some challenges around awareness of what these bodies offer and duplication of services. Moving to a pan regional model could help tackle these issues. The success of the Northern Powerhouse starts with having the right infrastructure in place. We need greater focus on the local road routes and rail lines that matter to small businesses. Headline grabbing projects have their place, but incremental investment in small scale projects would provide a bigger boost to productivity over the long term." The new report also recommends the creation of a Council of the North with responsibility for overseeing integration of regional activity and scrutiny of Metro Mayors. The installation of a People of the North body is suggested as a means to tackling skills shortages in the region. A previously unreleased survey conducted by FSB members in the North of England shows that, when asked which improvements associated with the Northern Powerhouse would significantly benefit their firms, small business owners most frequently identify better broadband (56%), better small business support (52%), lower business rates (51%), improved road infrastructure (51%) and enhanced mobile coverage (49%). Phil McCabe added:- "With LEPs, local authorities and Metro Mayors all working together to deliver the Northern Powerhouse, it makes sense to have a Council of the North to advise on pan regional activity. We have some significant skills gaps across the North West. Given that 1 in 5 UK small business employers relies on EU workers, there is a chance Brexit could exacerbate this issue. A dedicated body responsible for up skilling the North will help mitigate that risk. Above all we need to move towards a situation where people stop paying lip service to the Northern Powerhouse and start delivering the enhanced connectivity, improved infrastructure and integrated business support we were promised 3 years ago."